Since the discovery of vitamin E, research on this vitamin has mainly focused on its antioxidant properties; however, in recent years, the gene regulatory activities of tocopherols and tocotrienols have also been increasingly studied. The structural differences of the various vitamin E isoforms determine their biological and regulatory activities. It has been shown, as the first non-antioxidant property of vitamin E, that α-tocopherol inhibits protein kinase C and 5-lipoxygenase and also activates protein phosphatase 2A and diacylglycerol kinase. Furthermore, vitamin E modulates the immune response, in part by reducing inflammation and boosting the immune system. Long-term vitamin E deficiency affects hepatic gene expression by upregulating hepatic coagulation factor IX, 5-α-steroid reductase type 1 and CD36, as well as downregulating the hepatic γ-glutamyl-cysteinyl-synthetase mRNA level. Our in vivo studies in rats have also indicated that dietary vitamin E induces changes in steroidogenesis by affecting cholesterol homeostasis in the testes and adrenal glands. In addition, vitamin E has been suggested to modulate age-associated changes by altering the redox balance, resulting in altered gene and/or protein expression. 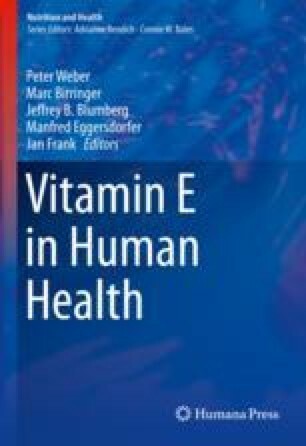 Finally, it has been shown that vitamin E controls cell signalling not only at the mRNA but also at the miRNA level.